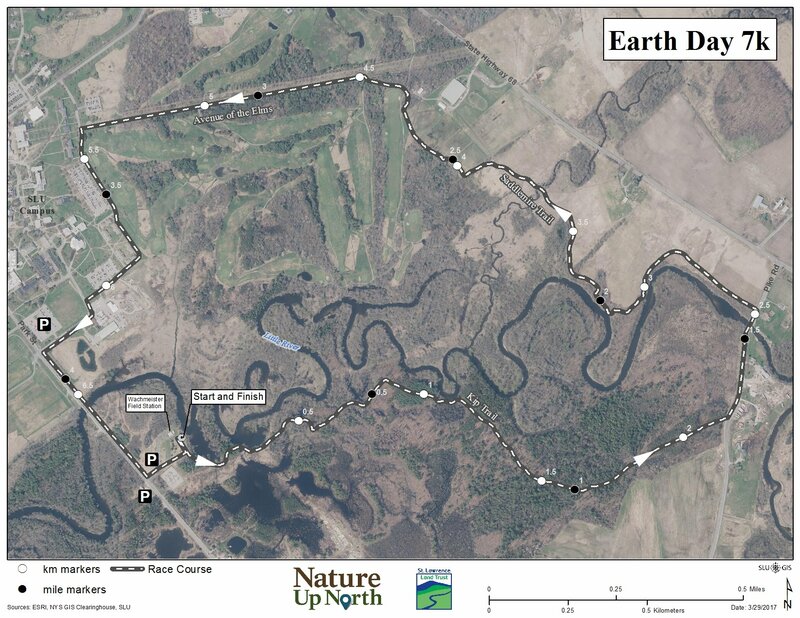 Nature Up North and the St. Lawrence Land Trust invite you to join us for the 4th annual Earth Day 7K Trail Run & Walk on April 27th, 2019, at 10:00 am. One of the few annual trail races in the North Country, proceeds from this race benefit local conservation and environmental education initiatives. Runners begin at 10:00 am at Wachtmeister Field Station. Race day registration opens at 9:00 am. Runners times will be recorded and available after the event. Walkers are welcome to start the course anytime after 9:00 am, and are encouraged to begin by 9:30 am. The flat 7 kilometer (approximately 4.4 miles) course connects the Kip and Saddlemire Trails at St. Lawrence University, passing through scenic forests and wetlands along the Little River. The flat terrain makes this course suitable for runners and walkers of all fitness levels. The course will be well marked, with volunteers at all major intersections. Short road segments connect the longer stretches of trail. Be prepared for a few muddy sections. Join us after the race for awards, a prize raffle, and refreshments! Information about sponsors and raffle prizes coming soon. The race fee is $20 for general admittance and $10 for students. Youth 12 and under are free. All proceeds for this event will be split between the St. Lawrence Land Trust and Nature Up North, and will benefit local conservation and environmental education projects in the North Country. Directions: The Wachtmeister Field Station is located just south of the St. Lawrence University campus on Park St./County Route 27 in Canton. If approaching from Canton Village, it is the first driveway on the left after passing over the wooden bow bridge over the Little River. If approaching from the south, the Field Station is the third driveway on the right after passing the Kunoco. Wachtmeister Field Station has a single indoor restroom. Please contact nfo@natureupnorth.org with any questions. The St. Lawrence Land Trust works with local landowners to conserve ecologically, culturally, and recreationally important elements of the landscape, while maintaining the private ownership of the land. Nature Up North is an environmental education and outreach project based at St. Lawrence University that works to offer hands-on and online opportunities for North Country residents to connect with the local environment.